Make Upholstered Headboard – Now that your bed is done, it’s time to get started on a beautiful DIY upholstered headboard! The first thing you should do is pick out your fabric. Find a swatch of whatever you like – whether it you go with microfiber, leather, or velvet – and bring it into your bedroom. Does it match your drapes? Walls? Comforter? Once you’ve found a fabric you like, start thinking about what shape you’d like your headboard to be. If you’re planning to cut out the design yourself, you might want to stick to something simpler so it isn’t as difficult. If you’re going to get the shape pre-cut, why not try a unique shape for your headboard? 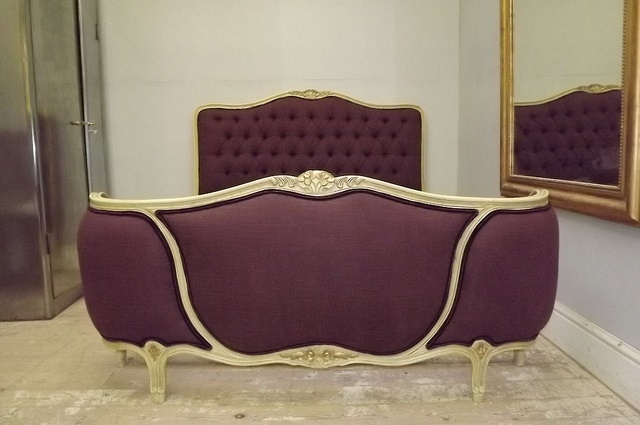 Research headboards on the Internet and decide on the shape for you. You’ll need to measure the width of your mattress before you get started. Your headboard should typically be slightly wider than your mattress. Then, you’ll need to decide how high you want your headboard to be. Are you using it for decoration only, or are you going to rest against it while watching TV or reading? If the latter is the case for you, make sure your head will rest comfortably against the headboard – and not the wall. Once you have your plywood cut out & sanded, either by you or a professional, you’ll need the foam cut next in the same shape. Remember that the foam should be around 2 inches thick to be properly comfortable. Then, you’ll need to get fiberfill cut off a roll from the store. Add about 12 extra inches, since you’ll need to wrap the entire thing around the headboard, and not just place it in front. When it comes to your fabric, you’ll need to do the same thing – order 12 extra inches, since it will wrap around the headboard too. Iron your fabric before you start working with it (if it needs to be de-wrinkled) – you’ll want it to be nice and smooth once completed. Place the fabric flat, faced down on the smooth surface. Layer the fiberfill over the fabric – they should be the same size. Next, put the foam over the fiberfill. Finally, finish off the layering with the plywood on top. All four of the layers should now be sandwiched together. The fabric and fibrefill should be equally aligned with each other, and the foam and plywood should be lined with one another. The fabric and fiberfill should extend more than the foam and plywood so it can be wrapped around the back. Pull the fabric and fiberfill to the back of the plywood and begin evenly stapling it in place with the staple gun. The staples should be ¼ inches in size, and should be applied 2 inches apart. Test it first – staple every corner, flip the headboard around, and see if it looks good. If so, continue stapling the spaces between, and if it doesn’t, take out the staples and try again. If there’s any excess material at the end, trim it off with your scissors. Now it’s time to put up your new headboard! Flush mounts are recommended for supporting headboards on walls. All you do is apply them to the wall, and the back of your headboard, and they slide together, interlocking one another. The headboard is guaranteed not to bang against the wall every time you get in bed, like some loose headboards! How do you install flush mounts? Locate the studs on the wall behind the space where the headboard will rest. Attach the bottom part of the flush mount to the wall and then into the studs as widely as possible (within the width of your headboard). Lean the headboard against your wall to get the location of the receiving flush mount on your headboard. Remove headboard and drill the holes for the mounts. Attach the mounts facing down, and then lift your headboard on your wall to secure it. Step back upholstered headboard – together! Remember, if the headboard is off center or just in a weird position, you can always reset the wall mounts – they aren’t permanent!